Feeling jealous of the Big Jelly Belly Man because he only has to work one day per year? 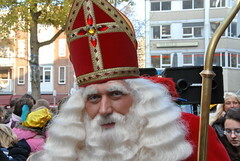 Well, take comfort: turns out Santa Claus, AKA St. Nicholas, actually works today too. Today is St. Nicholas Day, the day that children across Europe wake to shoes filled with presents from St. Nick. The St. Nicholas Day tradition is not all sugar plum fairies and delight, however. In Germany, poorly-behaved children may find a rute, or tree branch, in their boot. Not getting presents when your peers do is bad, but apparently not bad enough. In Germany, Switzerland, and Catholic sections of Austria and Bavaria, Nikolaus was accompanied by Knecht Ruprecht, a goat-legged antithesis to jolly Ol’ St. Nick. Knecht Ruprecht would actually threaten to beat, or even eat bad children. But since you’ve been so good this year, I’m sure you’ve had little experience with Knecht Ruprecht. If you forgot to leave shoes out last night, better be prepared for next year: find some nice big boots for St. Nicholas to fill. I vote for choosing Ugg’s Cargo IIIs for Nikolaus-Stiefels. They’re fuzzy, trendy, and pocketed, so you’ll have one more compartment for St. Nicholas to fill. This entry was posted on Saturday, December 6th, 2008 at 8:00 am	and is filed under Main, ugg. You can follow any responses to this entry through the RSS 2.0 feed. You can leave a response, or trackback from your own site.